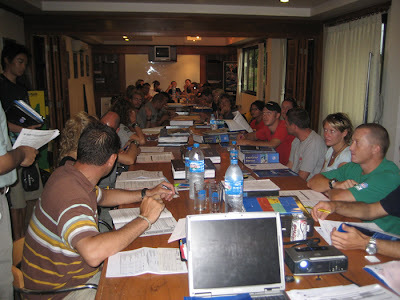 The September PADI IE on Koh Tao started today. With a good 30 candidates, including Nienke and Jeff and 3 PADI Examiners, Thomas, George and Young Hee the IE kicked off at 1 pm with an introduction by the examiners, followed by the 5 exams and a General Standards and Procedures exam. 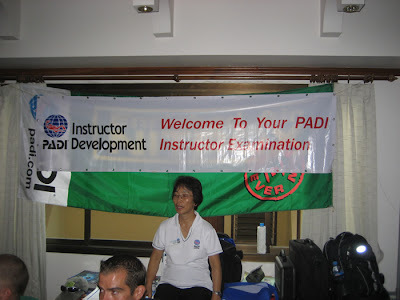 The official PADI IE banner with Examiner Young Hee Hanis sitting below it. Young Hee is Korean but speaks also English and German and she's PADI Asia Pacific's Korean liaison. The Korean market is actually growing rapidly right now and it's very exciting to see it develop. This is how a PADI IE with over 30 nervous and excited candidates looks like moments before the IE Orientation kicks off. Nienke and Jeff after (very) successfully completing their exams part of the IE, together with Amit, who came over together with us for moral support. One down, three to go.